brainwash our nation’s youth, push his socialist agenda into the classroom, and create a cult of personality among impressionable children. When conservatives started ranting about death panels, Mickey Kaus suggested that if Dems had any sense they never would have inserted the language about advance directives into their bill in the first place. They should have known it would cause problems. I disagreed: if it hadn’t been death panels, it just would have been something else. There’s no way to sanitize a bill enough to keep it safe from folks like Betsy McCaughey and Sarah Palin. But I’m on the other side on this one. What the hell was Obama’s brain trust thinking? 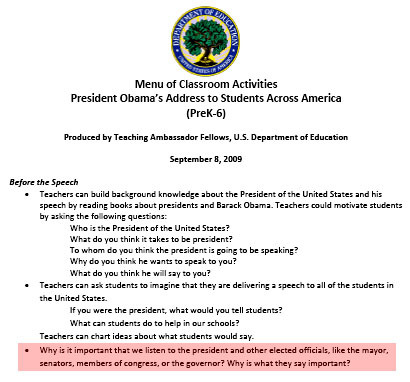 The whole idea of the speech may have been misguided in the first place given the realities of modern hyperpartisan politics (be honest: you wouldn’t have been thrilled if George Bush had done something like this), but including a bullet point asking kids “what they can do to help the president”? A five-year-old could have figured out that might cause a little bit of red-state heartburn. Obviously the president shouldn’t spend all his time worrying about what the lunatic fringe thinks. Still, the world is what it is. Why give them obvious ammunition?